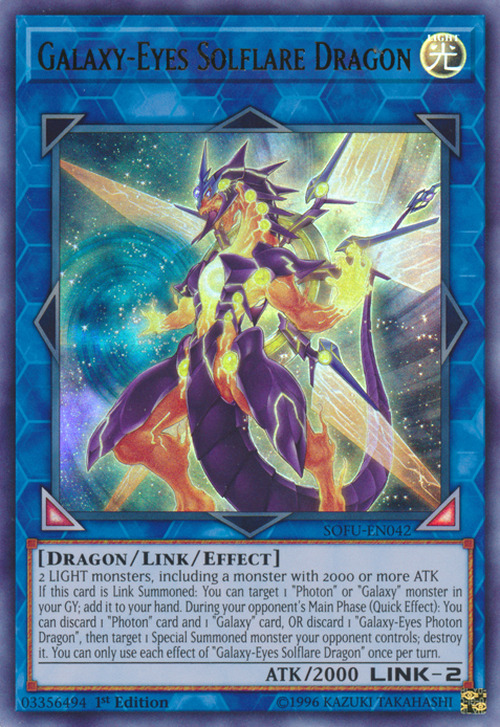 If this card is Link Summoned: You can target 1 “Photon” or “Galaxy” monster in your GY; add it to your hand. During your opponent’s Main Phase (Quick Effect): You can discard 1 “Photon” and 1 “Galaxy” card, OR discard 1 “Galaxy-Eyes Photon Dragon”, then target 1 Special Summoned monster your opponent controls; destroy it. You can only use each effect of “Galaxy-Eyes Solflare Dragon” once per turn. This card is the first Galaxy-Eyes Link Monster. It is also the first Link Monster to specify the ATK of a Link Material. This card's name comes from solar flare; a a sudden flash of increased Sun's brightness, usually observed near its surface. Powerful flares are often, but not always, accompanied by a coronal mass ejection, with the most powerful ones barely detectable in the total solar irradiance.